Takashi Uesugi is a freelance “journalist who TEPCO love to hate”. TEPCO are such an important advertiser that the television and newspapers are completely silent. Even now, they’re running TEPCO commercials on the television, aren’t they? This week, there are also full-page advertisements in the newspaper. Despite the fact that they’ve caused such a scandal, TEPCO are still putting ads in the newspaper. If they have such enormous sums of money, they should send it to the areas hit by the disaster. Takashi Uesugi: The Interview – Time Out Tokyo. 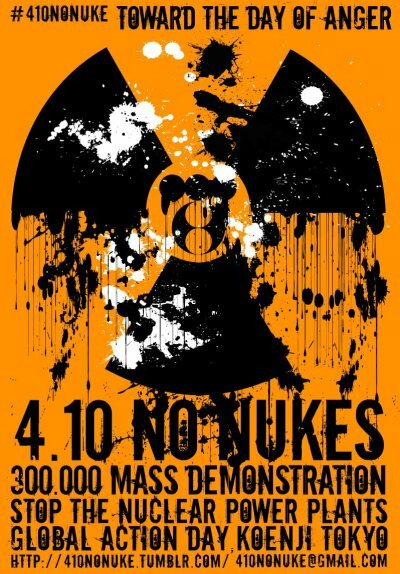 The protest against nuclear power plants are planned in Koenji, Tokyo on April 10th. Also, similar protests are scheduled on the same day around the country. As a result of the earthquake, the Fukushima nuclear power plant is now in a terrible situation. Even though we’ve always been told that it’s a safe and green power, in the end, an accident happened and radiation is being leaked!! To boot, the rescue in areas affected by the disaster is being set back, and the neighboring fishes, vegetables, houses, everything, has been ruined. Really, give me a break. We’d be better off getting rid of nuclear power at once. show them what we really want! all over the country and the world!